The only wolf species to be found in Africa is the Ethiopian wolf, which also happens to be the most threatened canid in the world! A recent detection of rabies further threatened the survival of the species. 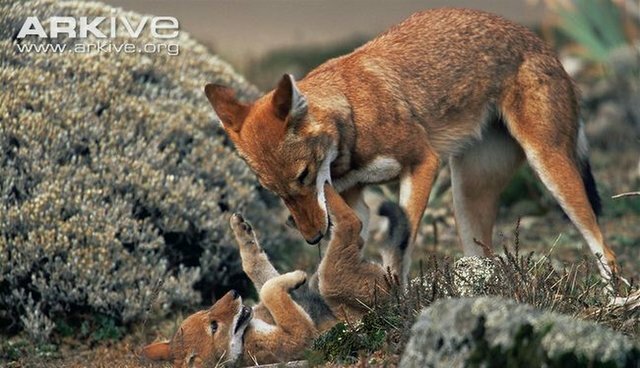 With support from CEPF through our investment in the Eastern Afromontane biodiversity hotspot, the Ethiopian Wolf Conservation Programme (EWCP) is working to halt rabies infections in Ethiopian wolves in the Bale Mountains Key Biodiversity Area of Ethiopia. This includes vaccination of domestic dogs, development of community awareness campaigns, monitoring of wolf populations, analysis of demographic data pre- and post-rabies outbreak, and the production of a "Disease Management Plan" for Ethiopian wolves, based on the new information and on the lessons learned during the current intervention. According to EWCP, "Despite the rabies outbreaks, no wolf packs went extinct in Bale this time round. Good breeding success rates indicate that at least the Sanetti population is already in its way to full recovery"
Read a report about the project.